About ICP Networks | Display Energy Certificate | An ISO9001 & ISO14001 company. ICP Networks award winning headquarters Lexicon House has been awarded an A Grade in energy efficiency. The IT and Networking specialists created the building from the ground up to consider every element that could potential have an impact on the environment and the result has been a head office that is effectively double carbon neutral. ICP Networks MD Matt Archer, said: "We are very proud to 'practice what we preach' and have what has been called by the Guardian newspaper the 'Greenest IT HQ in Britain', and has been case studied as part of a nationwide campaign by global energy supplier E-ON. Governmental officials inspected the building and gave it top marks, rating it a Grade A in Display Energy Certificate. 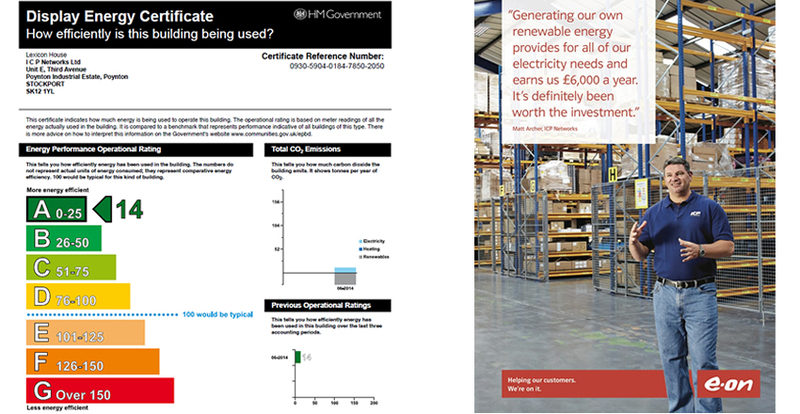 Display Energy Certificates (see ours here), or DEC, were introduced by the British Government in response to the EU Energy Performance of Buildings Directive which all EU member states must implement by January 2009. "DECs are designed to promote the improvement of the energy performance of buildings. They are based upon actual energy usage of a building and increase transparency about the energy efficiency of public buildings." Our 'A' grade for our Display Energy Certificate for our award winning building Lexicon House is an external reflection of the work we do day in day out for our clients in managing their IT assets within our modern Circular Economy. The certificate looks similar to the energy labels provided on new cars and electrical appliances such as fridges and freezers - it uses a similar scale for energy efficiency, i.e. from A to G with A being the most efficient and G the least efficient - ensuring ICP Networks clients understand how efficient we are when it comes to protecting the environment.